Recipients of large quantities of unwanted mail find it time-consuming or difficult to differentiate desired mail from spam, reducing their productivity. Aside from the direct costs generated by the consumption of Internet resources, such as network bandwidth, processing, storage space, and other requirements, there are also many indirect costs produced as a consequence. Past experience when anti spam systems were not yet common, users were taught to be reluctant to give their addresses out for fear of being added to and traded among thousands of mailing lists. This behavior restricts businesses from acquiring addresses for legitimate use. Likewise, a business, for the lack of an anti spam system may be reluctant to email their customer base for legitimate purposes for fear of being perceived as spamming. Also, the technical measures being used to prevent the relatively few that abuse the infrastructure result in compromises or expensive anti spam system acquisition that must be endured by everyone. Although distinguishing spam from legitimate email is subjective, the majority agrees that all forms of unsolicited email are undesired. People who receive relatively small quantities of spam, however, will often accept it as an annoyance and tolerate the problem, as they tolerate the problem as it increases, the lack of a credible anti spam system drives productivity in a downward trajectory. However, this attitude is one that can contribute to allowing spammers to continue their abuse, by tipping the economics in their favor, especially in the age of very expensive anti spam systems. With the cost-shifting associated with email anti spam systems and the distribution of costs over such a wide base, the costs to the spammers are almost none, and although the costs are shifted to the end recipients, they are also relatively negligible. The fact these individual costs are so small while organizations have to spend a lot of money for funding a credible anti spam system is what creates a problem on the larger scale. What makes this situation so dangerous is that when millions of people each suffer only a small amount of damage, it is often more costly for each individual victim to recover the minor damages imposed upon them. Funding for an effective anti spam solution is the problem to any small organizations. The population will continue to bear those unnecessary and detrimental costs unless and until their individual damage becomes so great that those costs outweigh the transaction costs of fighting back. Hence, spammers are able to continue their cost-shifting form of marketing, while companies are suffering how to balance anti spam spending versus their capability to remain profitable. Due to the low response rate of advertising through unsolicited email, it is important for a spammer to have a comprehensive list of valid email addresses and methods to bypass anti spam systems. Because few people would be prepared to knowingly hand over their address to a spammer, addresses are usually collected from the public domain, with most victims coming from firms that lack a credible anti spam system. Addresses are usually harvested using automated tools, as it bypasses anti spam systems that analyze online content for patterns matching that of an email address and clever tricks to bypass anti spam systems. Such tools may also include the ability to search websites and newsgroups using a particular keyword, making use of existing search engines while not triggering the anti spam system at the same time. This can make it possible to more accurately target users interested in a particular area. 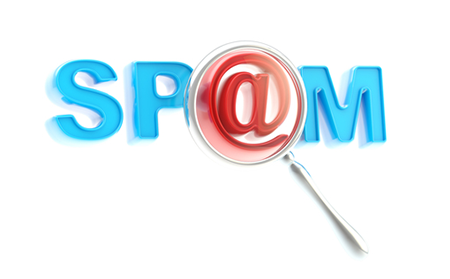 The low response rate from unsolicited email advertising, and the amount of other spam entering a user's inbox requires a spammer to compose messages that are more likely to capture the users' attention. Users have become accustomed to manually filtering spam from their mail than depend on a non-existing anti spam software. They will quickly delete messages that appear to be spam just from the subject line without even reading the message. This has encouraged spammers to entice users into opening mail or visiting websites by including seemingly legitimate subject lines and message bodies. With a list of addresses and a message composed to send, a spammer will use one of the many bulk email tools available to get his message across. To avoid getting his account terminated, attempts are usually made to hide the point of origin. This is commonly achieved by making use of misconfigured servers such as open relays or proxies. Not only does this help hide the origin of the spam, but also by offloading the responsibility of delivering mail to an open relay, a far greater throughput can be achieved. It will also help to deflect complaints to the relay. Companies need to implement a credible antispam app in order to help lessen the junk emails the mail server receive on a day-to-day basis. One such business antispam app is launched by Comodo. A trusted name in privacy and security, Comodo Dome AntiSpam app is a multi-tier system for fighting junk emails. Depending upon the requirement of the enterprise, Comodo Dome antispam app is a business anti spam personal solution which can be entirely cloud-based, hosted in the cloud, but connected to your mail server or a hardware appliance located in your own office network itself. Compared to a a typical antispam app, Comodo Dome antispam app is highly integrated with the mail server software that filters spam even as it has a real-time connection with the Comodo cloud servers. It is an appliance with advanced cloud-powered filtering capabilities. As it is a hardware appliance, it is OS-agnostic and runs parallel with your email server for a worry-free email infrastructure for your enterprise need. Being worry-free and less maintenance needed to deploy this appliance makes it the best antispam app available in the market today. Powered by a real-time cloud-infrastructure antispam app and threat detection system named Valkyrie, it filters emails and categorizes them as spam or not according to the real time signature system of Comodo. It is an all-in-one antispam app solution incomparable to the default basic free anti spam system that comes with the email clients. Comodo Dome AntiSpam app paired with Outlook is a multi-tier system for fighting junk emails. Depending upon the requirement of the enterprise, Comodo Dome AntiSpam app is a business anti spam software for Outlook which can be entirely cloud-based, hosted in the cloud. A 24/7 connection to the mail server or a hardware appliance located in company’s own office network itself. Such business antispam app, prevents delays from email sending and receiving, in contrast to a software-based antispam app plugin for Outlook that runs on the mail server that interferes with the operation of the latter in real time. Comodo Dome AntiSpam app never interferes with the normal operations of the end-user’s mailbox. Comodo Dome AntiSpam app masked itself by not running in each individual PC. Comodo Dome AntiSpam app only reveal itself to the system administrators through the dedicated control center. The Central Control Panel reveals all the adjustable options provided by Comodo Dome AntiSpam app in an easy to read format. Better than an entry-level free basic anti spam checker, Comodo® Dome AntiSpam app quarantines suspicious attachments. Enabling users to confidently open and access email attachments, as Comodo Dome antispam app scans the emails in the background for malicious contents that may harm your computer and the corporate network. Secure your enterprise, secure your future, choose Comodo Dome AntiSpam app versus the typical anti spam app solutions. The free antispam app filter for outlook used by your enterprise right now may not be able to cover the future requirement for anti spam personal. Sign-up for a trial today!